Considered a serious contender for the Nobel Prize in Literature, Banville has already won numerous awards, including The Booker Prize for The Sea and the Guinness Peat Aviation Award for The Book of Evidence. 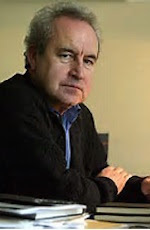 In 2011, Banville was awarded the Franz Kafka Prize, and in 2013 the Irish PEN Award, both for his life’s body of work. The Irish Times, where he became literary editor in 1998. Share A Writer’s Moment with a friend by clicking g+1 below.